Built in 1965, Tangent Elementary School is proudly educating its second and third generation of children. 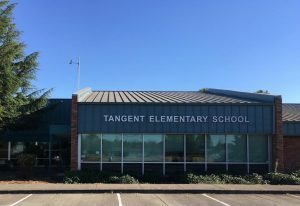 Located on an 8-acre campus amid fertile farm fields, Tangent Elementary serves a large area surrounding the community for which the school is named. To educate and inspire all students to reach their full potential, equipped to be positive, contributing members of society. As elementary educators, we realize our crucial roles in teaching reading, math, and writing. We are dedicated to focusing on academic skills while weaving in social emotional education. We offer music and pe classes to broaden out educational day to include fitness and the arts. Tangent Elementary students follow the schoolwide expectations that fall under “SuperSTAR” behavior: Safety, Teamwork, Accountability, Respect. Students who follow these rules are invited to participate in schoolwide celebrations throughout the year, such as special assemblies, “Minute to Win-it,” Inflatables and water fun! Students who are caught in the act with positive behavior are instantly recognized by receiving a Tangent Star ticket. These tickets are reinforced by the classroom teacher in a variety of ways. An area in front of our school has been designated as a habitat for plants that are native to our area. The purpose of this project is to familiarize students with plants that are native to Oregon. We bring our school community together each year with the following events: Fall Open House, Senior Dinner, music programs, La Tour De Tangent, and an end-of-the-year swimming trip. Community members and parents help in classrooms, prepare materials for teachers, work one-on-one with students, chaperone field trips and provide schoolwide assistance for events such as Senior Dinner and Parent Teacher Club events. The Parent/Teacher Club works tirelessly to raise funds to support student learning and activities. The club has been instrumental in raising funds for needed school items such as computers and projectors, library books, playground structure, and equipment. They also play a major role in planning and putting on our annual events and coordinate volunteering in the school.